This is a tasty dinner for a school night, using African peanut curry sauce from Bim’s Kitchen as a base, cutting down cooking time by an hour or so. It still takes a little bit of time, but not much effort. Serves two very hungry people or 3-4 at a stretch. Heat a bit of oil in a large pan, add the onions, garlic and chili and fry for a minute or so, without browning them. Add the chopped vegetables, and sauté for 10 minutes on a high heat, covered while stirring regularly. Add a pinch of salt at this stage. Add the curry sauce and a bit of water, cover again and cook for another 10-15 minutes. 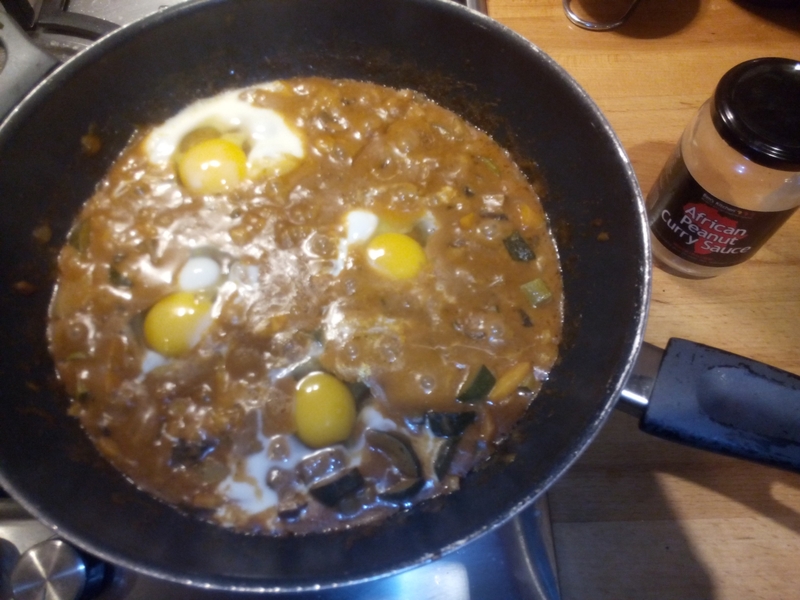 Crack open the eggs and gently slide then into the sauce. Cover and poach in the curry for about five minutes. Season with salt and pepper, serve with rice. 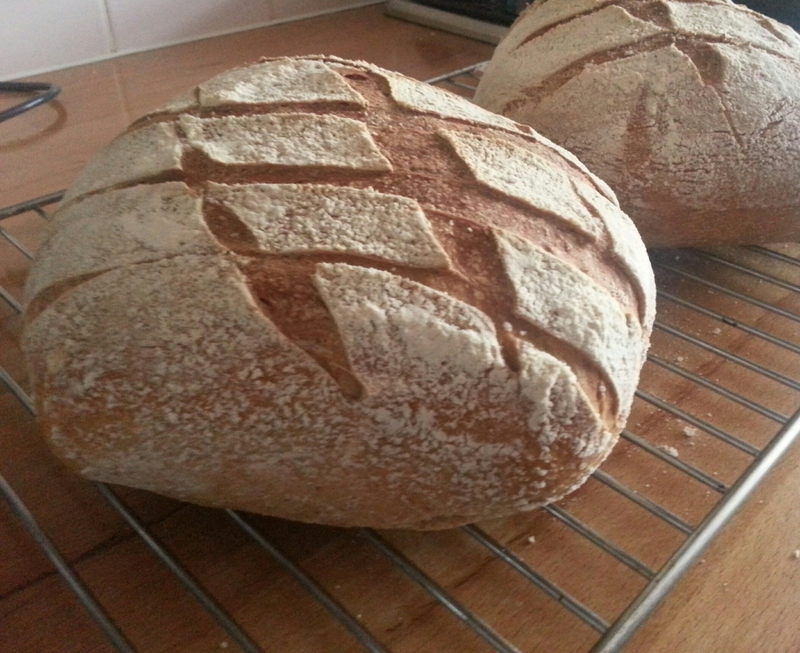 This is another recipe based on my all-rye sourdough starter, a rather recent addition to my repertoire of breads. I have to admit I have been reading the chapter of pure sourdough breads in Richard Bertinet‘s Crust and was a bit scared of trying it myself, but at some point last year I took the plunge and gave his recipe a go. The first try only looked a bit like a car crash, and after a while of experimenting and adapting the recipe to my starter and way of working, those sourdough loaves started to turn out quite nicely (and they are really tasty and keep for a few days in the bread bin). I called it an off-white sourdough as while it’s main ingredient is white bread flour, the rye starter gives it a beige-brown colour and a very distinctive taste that is clearly not white bread. salt after about 10 minutes. back to the bowl and rest for another hour. manhandle them or the finished bread will look like it had a car accident. Cut criss-cross over the top with a sharp blade. bake for another 30-35 minutes. 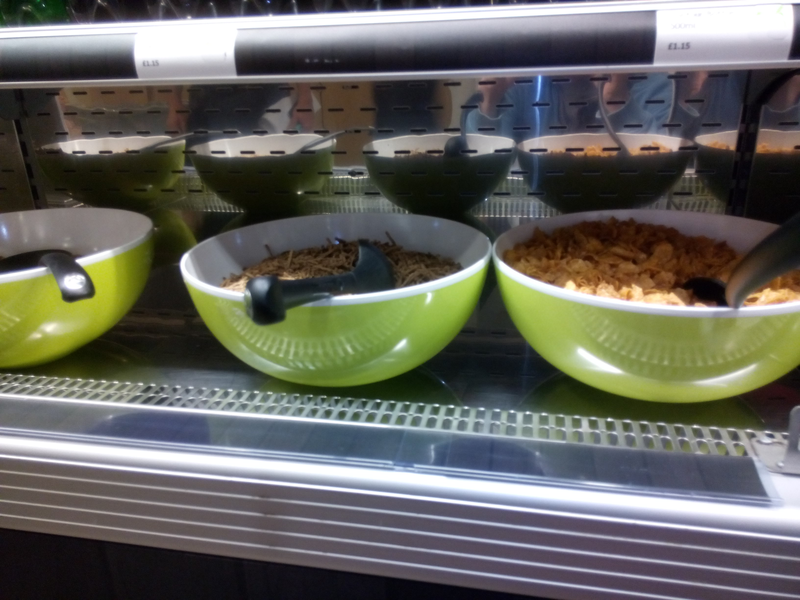 Leave to cool completly on a wire rack. This one is the staple I have been baking every other week for the last few years, and it’s the main bread that we tend to eat all the time. 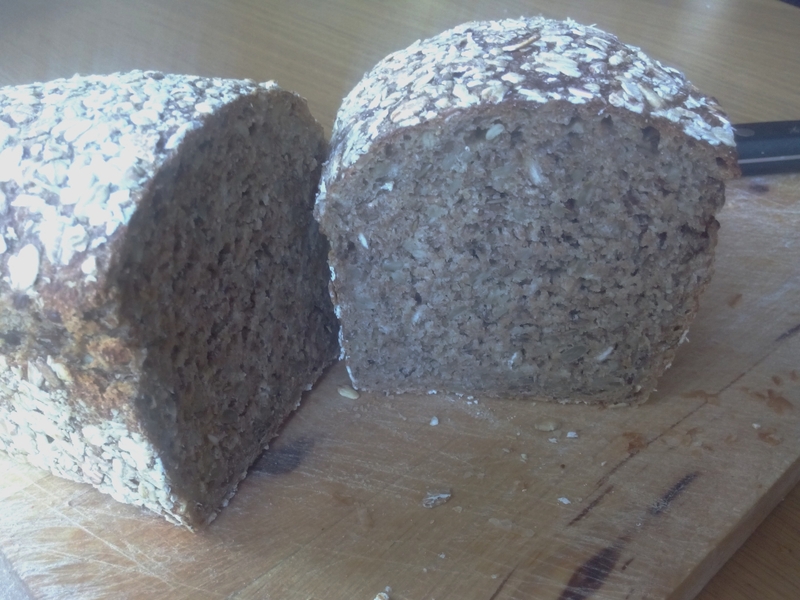 It is a true hybrid, 60% wheat and 40% rye, a lot of wholemeal and a bit of white flour, half yeast and half sourdough. Mix all the ingredients except the seeds in a bowl, and then work to a smooth dough. Towards the end, work in the seeds. Form a tight ball on a floured work surface, put back in the bowl, cover with cling film and leave to rest foot about 8h (I usually do that overnight). Then work into a ball again, split in half and work every half into a ball again and leave to prove in a proving basket for 1.5h. In the meantime, preheat the oven to 250°C. After proving, carefully transfer the loaves from the baskets onto a baking tray, and slice them across about every inch. This will allow them to expand to a more oblong shape and will give them the stripy pattern that gave them their name. Quickly mist the oven, then put in the loaves on the bottom shelf. Bake for 5 minutes, then turn down the heat to 220°C and bake for another 30 minutes. Remove from the oven and let them cool completely on a wire rack. The way I usually make bread is that I make a bunch of loaves every other week and freeze them so we always have nearly fresh bread – a loaf that has been frozen freshly after cooling down and then is thawed in the microwave is definitely nicer than a days old loaf, and much more achievable than baking every day. I’ll start with a fairly new creation I have come up with when I had a lot of sourdough starter to go through, but our freezer had died so I had no way of keeping a large amount of bread. So I made a very dark and heavy, pure sourdough bread. 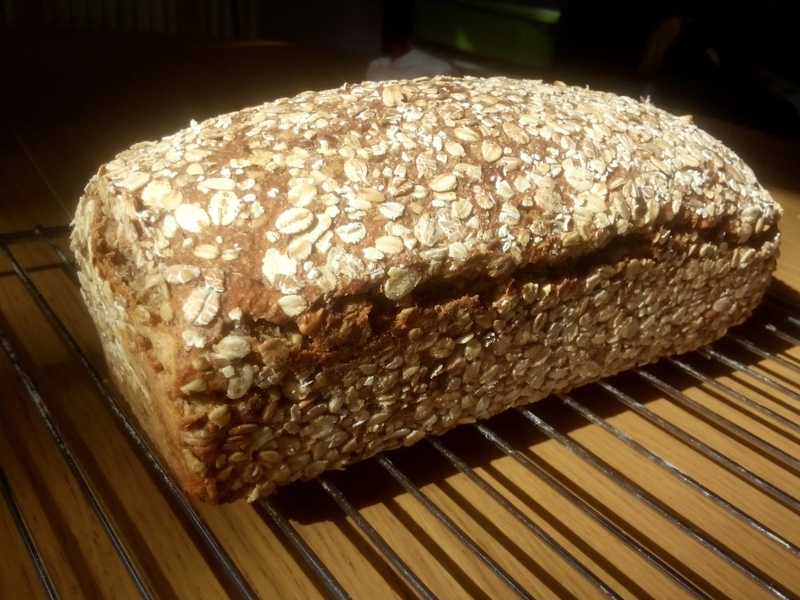 It is based on my rye only sourdough starter, and made with wholemeal rye and wheat flour, sunflower seeds, linseed and mixed rolled grains – I use Holland and Barretts’ muesli base, hence the name of the bread. 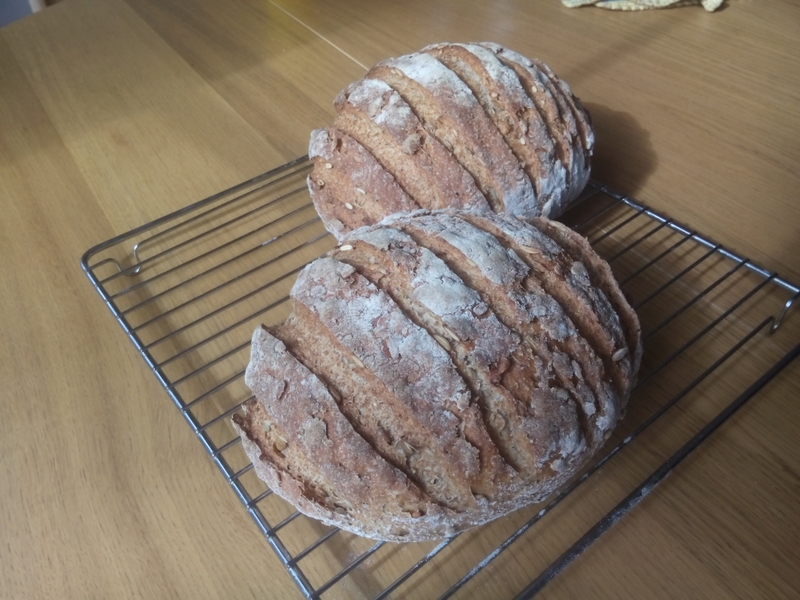 After a couple of iterations, I came up with the following recipe that yields a moist and rich bread with a noticeable but mild acidity – perfect if you love German or Eastern European wholemeal breads, but aren’t a fan of the really sour tasting varieties. Work all the ingredients to a smooth dough, preferably in a bowl as the dough is a bit on the wet and sticky side. Cover with clingfilm and leave to rest for 6-8h – I do this overnight. 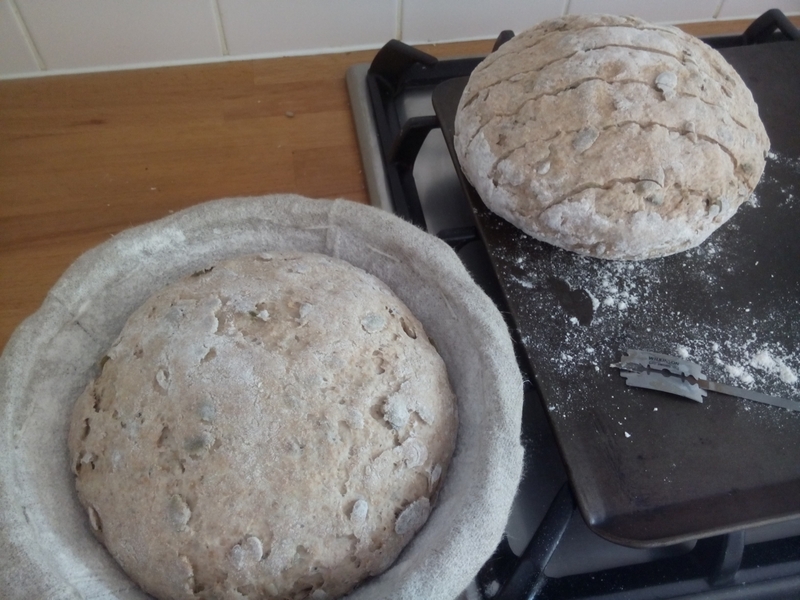 Work again quickly, shape into a longish loaf, roll in rolled grains and put it in a greased baking tin (I use a fairly big, long one). Cover with a cloth and leave to prove for 1.5h. Meanwhile, preheat the oven to 250°C. After proving, mist the oven with some water and bake the bread in the tin for 35 minutes, reducing the heat to 220°C after 5 minutes.